Whenever she felt like things couldn’t possibly work out between them, the photo she’d seen in a shop in Paris as a student came back to her. 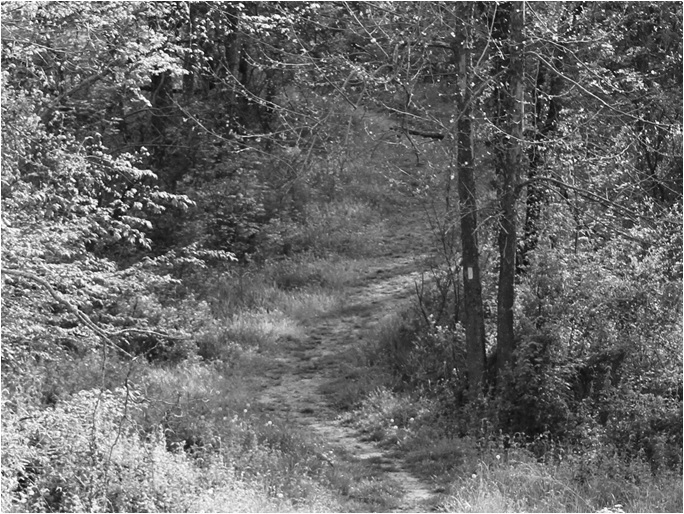 It was a black and white picture of two older people, walking along a path in the park. Their body language, hands entwined, leaning slightly toward one another, said it all: we are one, we are for each other. Like a totem, the picture reminded her of what lay ahead; that staying the course was the only way to get there. She drew herself up, reentered the room, her eyes on the future. awh very reassuring – that picture. And I like how it brought hope to her. Lovely. This makes me happy and optimistic. I really liked your vision and interpretation. My best friend and I are about to celebrate 46 years in the fall, not always easy but always worth it! Congratulations to you both! It is a rare thing anymore and not to be taken for granted! A nice take on the prompt. Well done. Thanks – interesting how much the photo changes when done in Black and White. I love how the picture only had anything to do with your story at the edges. It truly was inspiration and that’s sometimes where the best writing comes from. I loved your image of the old couple walking, still in love after all those years. Some weeks, that seems to be the case – the story ends up some where else than I’d intended! Yes this is inspiring, I love it! What a great way to show that it’s all too easy these days to give up on relationships and people and yet staying the course brings it’s own rewards, but to do that you have to compromise. Nicely written and I enjoyed it. Thank you for your comments – as always, they are most appreciated! I love the hope and commitment you portrayed in your story, Erin! I’ve seen photos like you described, and yes, they are inspiring. Thank you, Jan. I’m glad you knew what I was referring to. Thanks, Melania! I’m glad you enjoyed it. Lovely optimistic story. Beautifully written. Thanks for reading! I hope you have a lovely weekend, too. I agree with Linda (womanontheedgeofreality)–my sentiment to a “T.” Very nicely done–I love the hope that glimmers at the end. Nice, hopeful picture here – and love the black and white take on the photo prompt! Great job! Thank you, Karen. Your comments are always appreciated. Pictures are so evocative and I love this tale of hope. Nice job. Thanks, Emma. I enjoyed reading yours as well. I like the way you reference a photo as a ‘grounding point’ for the relationship. You know, I may just keep one of those B & Ws that come with the picture frame for the same purpose 🙂 Lovely story, Erin. Thanks for reading & commenting on mine. Russell, if that works for you, by all means you should do it! Sometimes those people look like they have it all figured out. Indeed. The picture that I reference is actually one I used to own with my ex-husband. We bought it together at a photography show. Deciding which of us would take it when we divided our things was probably the hardest moment in the whole process. He has it. A nice feel-good story. I really liked this. Wonderful symbolism, and a nice warm story. My version – http://newpillowbook.wordpress.com/2012/06/15/friday-fictioneers-a-walk-in-the-woods/. Thanks for commenting! Very nice. Sometimes things are clearer in a black and white photograph. Yes, I’ve noticed that as well. Thanks for reading! So true, but subtle as a black and white photo. Great reminder. Thanks for reading – I appreciate it! Am I getting a hint of a Crosby Stills and Nash song here? “Helplessly Hoping”? Either way, great descriptions and emotional impact without being sappy. Nicely done. That’s what I was going for – not sappy. Glad it came through that way. What a romantic take on the prompt – it’s amazing how the feeling changes to see it in black and white – some irony here beccause there is nothing black and white in a relationship. I like that comparison. You are so right! How romantic. We can all learn a lesson from this story. This is really wonderful, what I love the most about it is te fact that it is such a reality. Yeah even when we are married sometimes it just feels like you dont even know what is happening and how you will get through it but there is always that hope, something that bring us back to where we should be. I love that about your story. Thank you . Finding your way back is the hard part, isn’t it? Drifting apart happens gradually. Thanks – I’m glad I could provide a little light relief! That’s how love is, isn’t it? Unnerving and endearing at the same time. This was beautiful. Thanks for sharing! Thank you for reading – I appreciate your feedback. There’s so much more to a relationship than romance…although that’s a nice thing to have. Without commitment it’s empty. Nice story and very true to life. Yes – romance is how you get started, but commitment to staying the course is how you go the distance. Thanks – I agree – am trying to think of a better fit there. Apprecaite your feedback! Letting the small stuff roll off is important. Nicely done. Thanks – I enjoyed yours this week! I loved the way you used a black & white version of the picture prompt. I think it added to the sense of longevity and togetherness that you portrayed in your story. I liked the black and white twist. Loved how your character drew on an image from the past to help her face what sounds like a difficult future. Thanks – I’m glad you picked up on the difficulty. It was there, but subtle. I loved this one because of the affirmation of a working relationship. Everyone today is so eager to throw things away (including relationships) and this spoke to the exact opposite of that.